Princess Cruises guests aboard Diamond Princess will now enjoy a refreshed onboard atmosphere following an extensive 14-day, multimillion dollar dry dock in Singapore, continuing Princess Cruises "Come Back New Promise" commitment focused on investing more than $450 million across the global fleet. "Asia, and particularly Japan, is on many of our guests' bucket list, and cruising is one of the best ways to explore this hospitable island nation," said Jan Swartz, President of Princess Cruises. 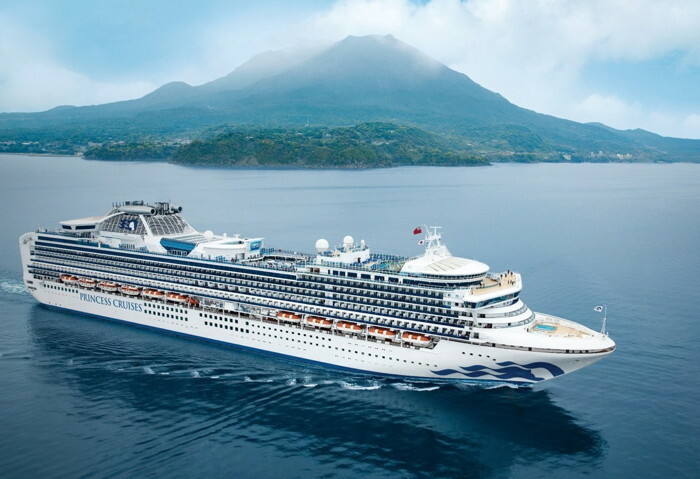 "This is the seventh season Princess Cruises has offered home port voyages from Japan, and we are thrilled to provide guests with our enriched onboard features that bring Japanese culture and beauty to life while sailing this region." The Princess Luxury Bed – available in every stateroom aboard Diamond Princess, the Princess Luxury Bed was developed by Princess Cruises in collaboration with board-certified sleep expert, Dr. Michael Breus. The bed offers the ultimate night of sleep at sea combining the science of sleep with the pinnacle of design and recently received the highest ranking for "Best Cruise Ship Beds" by Cruise Critic. In addition to the new wine menu, six new beverage menus will be rolled out at The Sanctuary, Pool Deck, Wheelhouse, Crooners, and Explorer's Lounge throughout 2019 onboard Diamond Princess. Built in Japan, Diamond Princess features the Izumi Bath, the largest open-air Japanese bath at sea – an 8,800 sq. ft bath and garden complex, offering indoor and outdoor Japanese bathing experiences including steam rooms, saunas and hot tubs with spectacular ocean vistas. Guests can experience the full color and culture of the region onboard with Diamond's distinctly Japanese offerings such as Kai Sushi, an authentic sushi bar, and traditional music and entertainment, all while enjoying the warm, welcoming service that is synonymous with Princess.